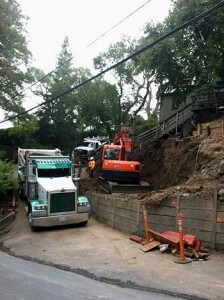 For over 26 years All Phase Excavating Service has been successfully providing "On Time, To Spec, On Budget" excavating services to general contractors, property developers and homeowners across the greater Bay Area. Headquartered in Rohnert Park with an equipment yard centrally located in Petaluma All Phase Excavating is your one stop excavating resource for virtually all of your excavating needs from site clearing, to site preparation to trenching to earth removal. When you need an excavating firm with experience, capacity, onsite management involvement and a history of meeting deadlines and superb client care then you need All Phase Excavating Services. We own an extensive inventory of excavating, drilling and hauling equipment. Our crews are all experienced, professional and safety conscious. Because we do not have to rely on outsourced equipment or labor we have an ability to scale, efficiently schedule operations and maintain a high standard of quality control. The advantage of using a single company for all excavating services is obvious; better communications, a committed work force, and far easier project management. Our commercial excavation experience runs the gamut from tract home developments, commercial centers to individual homeowners who want a pool or a spa. We have worked on difficult rural hillsides and in tight access urban environments. Clearing Includes the removal of brush, rock, trees and the demolition and removal of structures and concrete foundations and pads. From rough grading the entire work site, to the fine grading for new structures, curbs, sidewalks, asphalt paving, and landscape. Separating material, piling reusable material and removing others. For new installations or replacement of utility and plumbing lines, foundation backfill, irrigation systems or virtually any subterranean need. We have the equipment and the skilled operators to compact the site increasing its load bearing capabilities and reducing water seepage. Hauling. Our own fleet of "green" haul trucks can coordinate with excavation operations to ensure timely and efficient material export/import. We are competitively priced, proven performers, easy to work with and ready to take on your next excavation project no matter how large or how small. Contact us today and management will survey your site and provide a detailed proposal that will lay out the excavation plan and the pricing. "On Time, To Spec, On Budget" is not just a tagline with us…it's what we do!